The lowest price of Mobile Gear Gyro Anti-Shake 4K HD Waterproof Digital Camcorder With Accessories SJCAM sj5000 X Elite ( Black ) is at Flipkart where is it is for INR 8999. This price is INR 40000 lower than the other price for the product. The prices for the product change across variants. 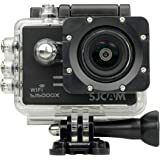 The price for Mobile Gear Gyro Anti-Shake 4K HD Waterproof Digital Camcorder With Accessories SJCAM sj5000 X Elite ( Black ) is valid across Bangalore, Hyderabad, Chennai, Mumbai, Delhi, Pune and Kolkata. The Mobile Gear Gyro Anti-Shake 4K HD Waterproof Digital Camcorder With Accessories SJCAM sj5000 X Elite ( Black ) is available at best price of INR 8999 on Flipkart. Value for money. Image quality and stabilization are very good. It has almost all accessories including water proof case. The only minus I felt was its battery backup.